Below you can view all the homes for sale in the Fairway Station subdivision located in Acworth Georgia. Listings in Fairway Station are updated daily from data we receive from the Atlanta multiple listing service. To learn more about any of these homes or to receive custom notifications when a new property is listed for sale in Fairway Station, give us a call at 404-998-4102. Great Home For The Growing Family; Awesome Schools Including The Infamous Allatoona High School; Close To Lake Allatoona, Lakepoint Sports Complex, Cobblestone Golf Course, Shopping, Dining And Close To The Interstates; Terrace Level Boasts Of An Open Family Room/Media Room, In Law Or Teen Suite, Full Bathroom And Private Entrance; Master Suite And Full Bath; Two Family Rooms Are Definitely A Plus; Updated Kitchen And Bathrooms; Two Private Decks For Loads Of Entertainment; Great Family Neighborhood In Popular Location; Come On Home; There Will Be No Regrets!! ! MLS#6527664. Re/Max Pure. The Multi-Level Back Deck Has Been Extended And Is Perfect For Entertaining. MLS#6522670. Atlanta Communities. So Fresh And Clean! Must See! ! MLS#6516303. 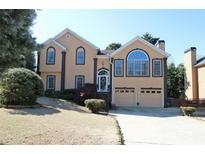 Knight Realty, Llc..
Minutes To Cobblestone Golf, Shopping, And Lake Allatoona. MLS#6512799. Keller Williams Rlty, First Atlanta. Home Comes With A 30-Day Buyback Guarantee. Terms And Conditions Apply. MLS#6050053. Opendoor Brokerage, Llc. Lots Of Square Footage. Priced To Sell! MLS#8308756. Maximum One Realty Greater Atl.